I grew up in Jacksonville, Illinois. My mother worked hard to raise us three kids, but our dad wasn’t around much when we were growing up. I can’t remember one Christmas as a child when our dad was home with us. We never had Christmas at our house or a tree or anything like that. But it seemed fine, because every Christmas morning our grandparents on our mother’s side always came and got our mother and us three kids. We went to their house and had Christmas there. Santa always took our gifts to their house — or so we were told. Our grandparents saw to it that we always had a good Christmas. One year, when we were about 12, 10, and 8 years old, our mother went to a lawyer to see about a divorce from our father. Of course we children didn’t know this at the time. That Christmas eve we went to bed with our coats on because we didn’t have any heat in the house. Yet when we woke up on Christmas morning we had heat. It was warm! We went into the front room and there was the biggest most beautiful Christmas tree we had ever seen. Under the tree were all kinds of gifts. Each gift had a name tag, with “To: boy” or “To: girl” written on it. Now we were old enough to not believe in Santa any more — but this was something strange! How did Santa do this? We decided that there must be a Santa. We had Christmas at our house, and then we went to our grandparents’ house and had Christmas again. That was the best Christmas ever. Later, when we were older, our mother told us she had gone to the lawyer about a divorce that year. It was he and his wife who had gotten the tree and bought fuel oil for our heating stove. They brought all those gifts to our house Christmas eve when we were asleep. Now how they ever got all that into our house and we three kids stayed asleep I will never know. You see, we lived in a three-room house that did not have any doors on any of the rooms. They couldn’t even have shut a door to stop us from hearing them. Yet somehow we did not hear a thing. I never knew who these people were that did that wonderful Christmas for us. As far as I know, they never even saw us kids. But we have never forgotten them. 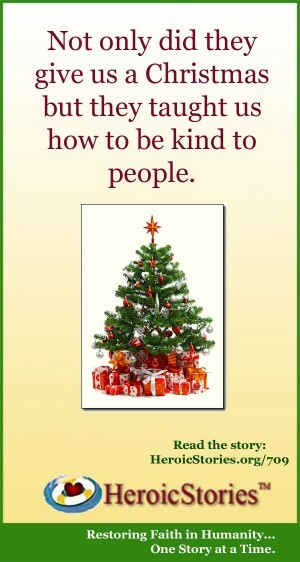 Not only did they give us a Christmas but they taught us how to be kind to people. I was never able to thank them for what they did, but since then I have tried to help people whenever and however I can. It’s difficult to read when your eyes are busy tearing up, but my heart was busy sending the warmth to dry the tears. Thank you, and I look forward to hearing more!